in the 2nd or 1st century BCE.  What is The Gundestrup Cauldron?  Where Was It Discovered?  What Are Its Characteristics?  How Was the Gundestrup Cauldron Made?  What Images and Designwork Were Involved?  Where Did the Gundestrup Cauldron Come From? Who Made It?  How Did It Find Its Way to Denmark? The famous late Iron Age vessel known as the Gundestrup Cauldron is one of the great pagan silver masterpieces of metalwork in the La Tene style, dating from the 1st or 2nd century BCE. (La Tene was a style of Celtic art that superceded the earlier Hallstatt culture.) Discovered in a bog in Denmark, its sides and circular base are decorated in relief with numerous mythological and ritual scenes, featuring figures of real and imaginary animals. The vessel's decorative features along with its high quality craftsmanship makes it an outstanding work of Celtic art, but debate continues as to its origins. Some archeologists place its manufacture in the western European zone of Celtic culture, probably Gaul, while others believe that it originated on the Middle Danube in Thrace (modern day Bulgaria), which was inhabited by Celts who were especially skilled in goldsmithing and silversmithery. The artifact is currently on display at the National Museum of Denmark, in Copenhagen. Note: Other famous Celtic La Tene-style artifacts include: the Petrie Crown, and the gold Broighter Collar. Other later vessels based on La Tene designs include the Ardagh Chalice and the Derrynaflan Chalice. Where was the Gundestrup Cauldron Discovered? It was found in a small peat-bog known as Raevemose, near the village of Gundestrup, in the Aars parish in Himmerland, Jutland, on May 28, 1891. The receptacle was unearthed in a dismantled condition, and botanical analysis of the surrounding peat indicated that the land had been dry when the cauldron was buried, the bog having developed around it in the meantime. also Stone Age and Bronze Age. were employed as cremation vessels. range of other, magical associations. deposited near a sacred spring. The outstanding find in this field is the Gundestrup cauldron. This enigmatic piece came to light in 1891, at the Haevemose peat bog in Jutland. It is made of solid silver and consists of 13 separate plates. These were originally covered in a thin layer of gold foil. One of them formed the base of the vessel, while the remainder were arranged around the inner and outer surfaces of the bowl. What Are the Characteristics of the Gundestrup Cauldron? The cauldron measures 42 centimetres in height, 69 cm in diameter, and is one of the largest known exemplars of Celtic metalwork art. When discovered, it comprised five long rectangular plates, seven short plates, one circular base plate and two pieces of tubing. Each plate is made of 97 percent pure silver is covered with numerous motifs of plants, human and animal imagery and pagan deities. The cauldron was reconstructed in 1892 by Sophius Müller: the five rectangular plates were arranged around the spherical base plate forming the inside of the vessel, allowing a 2cm gap between each (originally filled, it is thought, with metal strips); the seven smaller plates (1 is missing) formed the outside. Believed to have been a ceremonial receptacle used in initiatory rites, it was dismantled, repaired and reassembled several times during its life, but the repair work is clearly of a lesser quality than the original craftsmanship. How Was the Gundestrup Cauldron Made? Electron microscopic analysis indicates that the cauldron was built by three silversmiths. The bowl was beaten from a single sheet of silver, while the plates were almost certainly worked on when flat, before being shaped into curves and soldered together. To obtain the relief pattern on the plates, the silver was slowly heated and cooled before being shaped using the high repoussé technique; the resulting indents were then firmed up with pitch to enable them to withstand additional decoration with 15 separate punches and tracers, after which the pitch was then melted off. Some of the patterned areas were then covered with a thin layer of gold (gilding), while the eyes of the larger figures were inset with glass. The silverworking methods employed to make the cauldron are quite different from those used on other Celtic metalwork, but are consistent with techniques employed by Thracian master-craftsmen. What Images and Designwork Does the Gundestrup Cauldron Have? If the contruction of the cauldron is Thracian, its ornamental motifs are undoubtedly Celtic. It depicts a wide range of mythological scenes, including animal sacrifices and initiation rites, among others, along with numerous types of figures such as: deities, human, humanoid and therianthropic imagery. Animals represented include bulls, hounds, stags, wild boars, lions, winged horses, birds and dolphins. However, the imagery on the cauldron is highly ambiguous and has done nothing to resolve the issue of its provenance. The seven outer plates depict the heads of impressive, torc-wearing characters, presumably deities, accompanied by a few tiny figures. The inner plates are crowded with smaller, narrative scenes. Among these, there are two images which have aroused particular interest in Celtic circles. The first of these shows a figure wearing antlers, sitting cross-legged on the ground. He wears a torc around his neck and, in his hands, he holds a second torc and a ram-horned snake. A medley of animals are clustered around him, including a boy riding on a dolphin. This figure is usually identified as Cernunnos, the Celtic god of fertility and nature. His presence would explain the various creatures in the background, particularly the ram-horned serpent. The latter was a hybrid mythical beast, frequently portrayed on Celtic artefacts. It combined the fertility symbolism of the ram with the regenerative powers of the snake -an association stemming from the creature's ability to shed and renew its skin. By tradition, most Celtic gods were shown wearing torcs, the conventional emblems of rank and status. Where a second torc was depicted, this usually represented abundance, a quality which is entirely appropriate for Cernunnos. Adjoining this scene, there is a second plate with strong Celtic associations. This portrays a procession of horsemen and foot soldiers. The latter are carrying the long shields with bosses, whieh Celtic warriors are known to have used, and they are accompanied by three figures blowing boar-headed trumpets. Above, some of the cavalrymen have boar-crests on their helmets, a well-documented feature of Celtic armour. To the left, a giant immerses a dead man in a large vessel. This is normally interpreted as an illustration of the resurrectionary powers of cauldrons, although there are some who see it as a human sacrifice to Telltates, the Celtic god of war. The victims who were offered up to this deity were usually drowned. Two other plates on the Gundestrup cauldron relate to the sacrifice of bulls, which was also commonplace among the Celts. Where Did the Gundestrup Cauldron Come From? Who Made It? Some scholars believe that the cauldron was made by Celtic craftsmen in Northern Gaul. In support of this view, they claim that the figures of gods on the walls of the vessel represent Celtic deities - for example, one antlered or horned figure is identified as Cernunnos, while the figure holding a broken wheel is believed to represent Taranis. 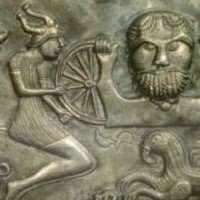 Another Celtic scholar identifies the horned figure as Cú Chulainn, interpreting the entire tableaux of Gundestrup Cauldron as a precursor to the Irish myth of Táin Bó Cúailnge. In any event, all say that the appearance of torcs (neck bands) on some of the figures suggests a clear connection with Celtic culture. Proponents of this theory date the cauldron to the final stage of late La Tene period (1st century BCE), as by this time, non-traditional Celtic images like fantastic animals start to appear on Celtic coins. In addition, they point to similarities between the Gundestrup and other bronze cauldrons of Late La Tène, made in central and western Europe. A case in point is the Rynkeby Cauldron, also discovered in Danish bogland, which is almost identical in size with similar decorative plates and some commonality of motifs. Opposing scholars, who claim that the cauldron is of Middle Danubian Thracian origin, date the vessel to the late 2nd century BCE, and base their case on the cauldron's construction technolgy (unknown in Gaul at the time), and point to the similarity between its animal imagery and that of other Thracian metalwork, as in the use of hatching lines and dot-punching to decorate animal bodies. The dating of the cauldron is critical. If it really was constructed during the late 2nd century BCE, it cannot have originated in Gaul, because silver-smithing techniques like high repoussé, partial gilding, pattern punching and glass-insets - all of which were employed to make the cauldron - were not known by Gaulish craftsmen. Unfortunately, no precise dating or provenance of the cauldron can be established, as the silver used cannot be traced to a precise mine: however, the actual weight of silver used has been calculated to be the same as the weight of a standard number of Persian siglos, a coin commonly used in Thrace in the 2nd century BCE. The debate continues. How Did the Gundestrup Cauldron Arrive in Denmark? Whether made in Gaul or Thrace, how did the vessel arrive in Denmark? Several explanations have been mooted. Either it was imported into Denmark; or it was one of the spoils of war acquired by German cavalrymen from Denmark, employed by Roman commanders in Gaul. A more complex account has it being made by a silversmith in Thrace where it was looted by the Germanic Cimbri tribe - who had strong connections with Denmark - when they invaded the area in 120 BCE. The rich decoration and complex symbolism of the Gundestrup cauldron are unique, but a number of other, less famous cauldrons can also be linked with La Tene artists. In 1952, the remnants of a bronze cauldron were discovered at Bra, in eastern Jutland. The vessel had been deliberately broken up, doubtless as a form of ritual damage, before being buried in a pit. Although considerably plainer than the Gundestrup cauldron, the Bra vessel was much larger, with a capacity of around 600 litres. Its main features are a series of bronze mounts, which were originally attached to the rim of the vessel. These include five bulls' heads and a vicious-looking owl mask, all of them fine examples of the Plastic Style of decoration. The cauldron is thought to have been made in Moravia. The bull motif was repeated on another damaged cauldron, which was discovered at Rynkeby on the Danish island of Funen. See also: History of Irish Art.  For information about the crafts history of Iron Age Ireland, see: Irish Art Guide.  For more on the history of Celtic metalwork, see: Homepage.